LOL!!!! I thought about that after I hit submit. Like I said I have only been to the steps once and didn't do much looking around. Thinking of heading out there on Friday morning after my son's doctor's appointment. Fished from 6:30 to 8:30 pm and I feel like I smoked em yesterday. There for a while I was catching a fish on every cast, it was awesome. I do not have an exact number, I left my counter in my truck, but I'll guess at somewhere around 40 fish. I have also smashed the barb on my hook while catching whites this year. As long as I keep tension on the line they never get off and I can release the fish in a heart beat with little to no harm to the fish, that's why I do this. It also allows me to get my bait back when I snag something. So it covers two topics and it works great for me, plus I can get a fish off the line in a split second. Just got back from a trip to the coast for sheepshead. Heading to steps tomorrow to hopefully get in on some of this action. I went to the steps last night, arrived around 6:45 pm, it was slow. As the sun continued to go down the fish began to move up in to the shallows. The bite did get better, but here again, it was kind a slow. Fished till 10:30 in hopes the bite would increase when the moon light popped over the tree line. It continued to be slow, but still catching. 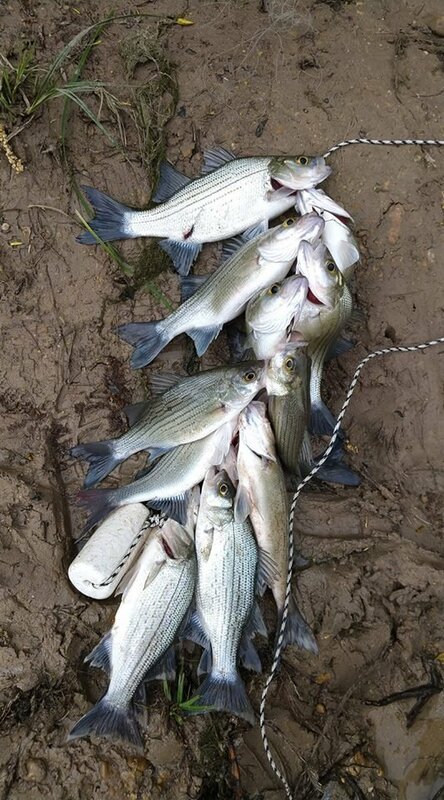 So I was on the river for almost four hours and I ended my day with 33 white bass. It's crazy, you shine your light out in the river and you can see fish everywhere, big fat females and I have yet to locate a hot spot where I can catch a few of these bigger fish. I would not keep any of these huge females, I just want to catch them for the sport. Matter of fact I haven't been keeping any of my fish for the past week, it has been nothing but catch and release. I think I have enough in my freezer to last through the year, or I hope it's enough anyway. I would rather be short on fish than have more than I'll eat and then end up wasting some. I don't like to keep meat or fish in my freezer for over a year. I was like five miles from the steps this afternoon so thought I would walk down with a rod and check it out. It looks nothing like later on in the afternoon, I did see a few here and there so I tossed out my jig a few times in the fifteen minutes I was there and landed two fish, small fish, but it was something. Headed home to change cloths, shoes and grab a hat, plus I had a few things that I needed to get done, but I'll be going back over there in a little while. I was at the steps yesterday from 10am to 2pm. Sometimes it's fast or famine out there. For me it was definitely famine. Walked out with only for males on my stringer. I guess the key is to go later in the evening. Don't think I will get a chance to get out again this season. Happy fishing y'all. So I returned later on Friday to get that late afternoon bite and I did not do as good as the days before. I ended up with a catch of eight fish in all. I fished Willis creek then went to steps later in afternoon. I was also dealing with some back issues, so I had to call it sooner than I wanted to. But that's okay, I still managed to get a few. This morning from 6:30 am to 11am, first 3 hours used rooster tail caught 4, then someone reached limited and gave me some minnows. Total got 13. Live bait is great right now. Everyone I know that is using live bait are really catching some good stringers of big fish. WHERE DO YOU SET YOUR DBS? WHERE DO YOU SET YOUR DRAG? All set and ready to go again!